These nonlinear sections weave through numerous subjects, sometimes about the roots of baseball and baseball traditions, sometimes about the strange cast of players and owners. Josh also writes funny anecdotes about his own experiences playing the sport, and the socio-political incidences that have occurred related to the game both in the US and around the world. War comes up a lot, and not just in reference to Abner Doubleday playing rounders in 1861 (or whatever). This is a serious book, heavily researched, and complicated. In fact, referencing the Royals’ current success is misleading, given how little attention Josh pays to the scoreboard compared to the game as cultural soporific or propaganda machine. You worked on this for years and years, right? I started writing in late 2004. I remember flying to Amsterdam that Christmas to visit my sister and taking on the plane a pile of old newspaper clippings about Lew Burdette, the Braves pitcher who was good at beating the Yankees. But I think the genesis of The Devil’s Snake Curve was the year before, during the months leading to the Iraq war. Like millions of other people I was against what was clearly a war of choice in Iraq, and even in the New York Times there was enough doubt about WMD and about the lack of connection between Iraq and 9/11 that it was obvious our country was about to go off the rails. During those very same months, The Field Museum, where I worked, hosted an exhibition called “Baseball as America.” I went through the exhibit many times, and enjoyed it, but the more I thought about it, the less I was able to reconcile the mythology of the sport and of our nation with the incessant warmongering. Then we started bombing Baghdad. The Devil’s Snake Curve is my attempt to reconcile the darker aspects of American history with the ways professional baseball has been represented. That old cliché about the Black Sox—“say it ain’t so”—well, that’s how I feel, but with regard to the ways the sport has been used as a public relations vehicle for war during the past decade. Was this the book that at one point was called “The Case Against the Yankees” or “Let’s All Hate the Yankees”? Wow, I can’t believe you remember that. Yeah, the first title was Let’s All Hate the Yankees, and that lasted about six months. It was too straightforward, and so were both the subject matter and my writing, so I threw everything away. Then for several years it was a novel called The Case Against the Yankees. It was about a fictional father and son who spend their lives—which span the twentieth century—trying to prove the Yankees are the worst team in baseball history. It was a lot of fun to write and revise. It was about our ability as people to believe lies, to create false evidence, to damage others for the sake of an obsession. Very much influenced by the Iraq war in that sense. The central gimmick or structural trope in the novel was that as the narrator, I had found a trunk of documents containing the work of this father and son at an estate sale, and the book unfolded as I told their story based on their collection of “evidence.” I decided to throw this novel away because when I moved to Minneapolis in 2008, I discovered that the subject of my second book, a uranium miner, had stored his belongings in a warehouse. Since real life suddenly suggested that I use the structure of my novel in my then-unwritten nonfiction project, I decided to dispense with the novel in order to avoid repeating myself in book number two. Was there a point at which you said, “Okay, I have to stop working on this”? Beyond the constraints of working a serious job in Chicago, one reason The Devil’s Snake Curve took so long to write is that with each draft I was refining not just the prose, but also how I viewed the sport and its role in American culture. When I started the version that Coffee House Press published, I actually decided that I would aim not for publication, but to achieve my creative goals. Basically, I wanted to use the language and history of baseball as a way to gesture toward, and bump against, issues of greater significance. People assume that when you watch a baseball game on TV, you’re just watching a baseball game. But if you look closely, all kinds of things are going on that a viewer just passively absorbs. For instance, I watched the season opener between the Dodgers and Padres. The Padres wore camouflage uniforms, and there were military personnel all over the field before the game. Why is a Major League Baseball team supporting the military? That’s an honest question. I don’t understand it fully, and that’s why it’s interesting. And as I watched I thought about how a team’s name, the Padres, calls to mind the history of Catholicism and its role in the conquest of the Americas, including what is now southern California. But team uniforms and team names are normal when they appear on TV, so their meanings and implications are less visible. This is not the fault of baseball; it’s just how culture works in general. I think it’s worth making visible these intersections that are already present in how the game is packaged so that people can think about them if they wish to. To answer your question, I decided that if the version of the manuscript that was truest to my vision was rejected by 100 publishers, I would quit. But it was picked up by Coffee House quickly. Will you talk about the path to getting the book published? By the fall of 2012 I’d revised the manuscript so thoroughly that I could no longer see the words on the page. I had found a structure I liked, and I decided the time was right to submit. I have an agent, but she had signed on to work with me on the uranium project, and she also happened to be on leave for a few months starting that fall. With her blessing, I submitted to a couple of presses directly. I asked Mr. Adam Robinson of Publishing Genius Press if he had any ideas about where I should send it, and he gave me a few names. But at that same time, I submitted to Coffee House Press because they had published the collected works of Paul Metcalf, who wrote dense, oddly structured, brilliant books, and had written a little about baseball. Within two days Chris Fischbach, the publisher, called to say he wanted my book. I was shocked. This kind of speed is not typical. I had met Chris and others at Coffee House a couple of times through my work at Graywolf, and could have tried to go around the slush pile. But since I had only been at Graywolf for a few months, I didn’t want it to seem like I was improperly taking advantage of my situation to further my own writing career. I am very lucky things turned out the way they did! Chris and I met for coffee the day after his phone call, and he clearly understood the book and was passionate about the content and my aesthetic approach. When I said I wanted to include line drawings he recruited a genius named Andy Sturdevant to draw them based on my ideas. Publishing with Coffee House was basically a perfect fit. I needed a literary publisher because I deliberately took chances with form and experimented with what I felt were new ways of making meaning, and yet I also needed a publisher who cared about baseball enough to value the detailed history. There can’t be that many people who both fit this profile and are in decision-making positions in the publishing world, so I’m very fortunate. We went back and forth on a couple rounds of edits, but it was nothing too major. These edits improved the book and helped me cut things that were unnecessary and also clarify things that might not have seemed important at first glance. But I think the main suggestion Chris had was that my use of present tense for the personal anecdotes might be worth reconsidering. So I reconsidered it, and then agreed and rewrote those sections. How does the publication process for this book jive with your experience at Graywolf? At Graywolf I work in development, which means fundraising. So I write grants in partnership with others in the office, and I also contribute to our work with the many individual donors whose generosity is hugely important to Graywolf. I won’t name names, but I can say after a few months at Graywolf—before I submitted my manuscript to Coffee House—that having my grants vetted by members of the editorial staff taught me a lot about how to be concise and eliminate unnecessary words. I’m still learning, of course. Anyway, all that’s to say my work at Graywolf is segregated from the publication of our books. I see the publication process in most of its phases, but my job is to ensure that we have the funds available to prioritize literary quality above commercial concerns. As an author, and one whose book is deliberately challenging and complex for the reader and actually works against dominant ways of seeing the sport of baseball, I believe in the importance of nonprofit publishing more than ever. It’s possible a commercial publisher would have picked up The Devil’s Snake Curve—but at a place like Coffee House, the emphasis is on the book itself rather than whether it is guaranteed to sell 50,000 copies. That doesn’t mean commercial publishers don’t do good work. But it’s true they are beholden to the profit motive in a way that nonprofit houses are not. Shameless plug: if you care about books that take chances and aren’t the norm, please buy them from places like Coffee House and Graywolf and Milkweed and Publishing Genius (there are many others too). If you remember the role the independent record labels played in the eighties and nineties in the context of commercial radio—I’m thinking of Drag City, Sub Pop, Merge, Matador, etc—nowadays it’s the independent literary presses that are doing the equivalent work, but by publishing books. Another process question: the book has a sculptural quality—how much of it was composed in order, and how much did you fit together like a puzzle? I wrote The Devil’s Snake Curve in a completely different order than how it appears in the finished book, but in revision I worked very hard on “flow.” I found the present structure by physically cutting the sections into pieces, arranging them on a table, color coding them by theme and by chronology, and experimenting with the best fit. Then I got good advice to do the exact same thing again. Two years later I did. This second time I came up with a macro-structure that is intentional and that works. The major sections are: Origins, Machines, War, Animals, and Nationalism. During this time I happened to visit the New York Historical Society and fell in love with Thomas Cole’s painting series called The Course of Empire. That helped me think about dividing my book into five parts. Because I was walking away from my background in anthropology, or at least the theory-making portion of it, I dreaded using explicit explanation as a tool in my writing. It’s just too easy for me to dismiss or think my way around it as a reader. So I cut most of that, and let word choice, juxtaposition, and structure do the work that a more forceful narrator might have done. One of the working titles was Baseball, Hair, Hot Dogs, and War. That encompasses some of the themes, but I ditched it because it was too direct. The themes include: the relationship between physical violence (usually war) and elements of mass culture that serve to normalize that violence (MLB’s support of the military, for example); the historical trend toward documentation and quantification of human behavior, and how that information is used for social control and profit-making—and how just as frequently that information is a misrepresentation of reality because people are complex, they rebel, etc; the creation and exploitation of new markets by capital, which in this book takes the form of MLB, and, well, I’ll stop there because I’m proving in the above sentences why I felt so strongly I needed to avoid theory-making and overt narration in this book. I have this tendency from my training in anthropology to make theoretical abstractions that I distrust even as I make them. So that’s why I spent so much time removing theory and narration from this book, and instead just included examples that fit my underlying theoretical goals. Moving on. The Royals’ rivalry with the Yankees is a very real theme in the book, and it was fun to write. As for my own glory days as a player, I appreciate your choice of words because I love Bruce Springsteen. I included that thread very deliberately as a kind of tonal counterpoint to all the historical vignettes and especially as a way to work against the darker elements. I love playing the game, and that’s the deeper origin of this book. And I’m fascinated by the ways the game’s meanings merge with other elements in the culture, whether war, religion, politics, or human anxiety about our position within the animal kingdom. Speaking of the animal kingdom, I love your characterization of the book as “the history of baseball as it pertains to mustaches.” The more theoretical way of saying it, and the way I came to see it, is that the book is about the domestication of the human animal as seen in the sport’s relationship to facial hair. How do you characterize the book when you’re at a sports bar and someone asks what it’s about? Baseball fans are smart and know their history. I’d probably start with the line about the book being about the role of facial hair in the sport, because most serious fans are aware that Steinbrenner (the late Yankees owner) had a complex about it, and of course they remember the wooly Red Sox of 2013. But I also might talk about the Royals’s rivalries with the Yankees or the theme of war. If a ballgame is on TV, these days it only takes about five minutes for a symbol of the US military to be shown on screen. That’s a potential entry point to a conversation. How about to a commenter at the excerpt posted at Salon.com? I’m not under the impression that people who comment anonymously on websites about other people’s work are open to having anything described to them. So instead of answering your question, I’ll talk about reading. About fifteen years ago I started wondering what would happen if I attributed importance, a priori, to any given text or book I was about to start reading. What if I opened my mind and allowed an otherwise “normal” book to speak to me, as though it was a religious text? So I experiment with this every now and then, and not just with books, but with entire days of my life. I have found that if I attribute special importance to books or movies or music or people, my interaction with them becomes more intense and meaningful. And even a banal book can speak to me when I position myself this way. This is a source of artistic power. A recent example is that I’m reading a book by Mickey Mantle called The Quality of Courage: True Stories of Heroism and Bravery. I bought it because it seemed too funny to pass up, but then I wondered what would happen if I attributed seriousness to it. And it turns out that Mickey Mantle had some wise things to say. When I discard this particular lens, I’ll probably return to thinking Mantle’s book is a joke, but for now I’m having fun seeing how it changes my viewpoint. How about when you’re at some sort of academic convention? Do you explain it differently? If I was at an academic convention, instead of explaining The Devil’s Snake Curve I’d probably catch a cab to a ballgame or a natural history museum or a matinee of some pulpy movie. But to answer your question, yeah, I could describe in detail how my book is a representation of how baseball has been represented throughout the last century. These representations in advertisements, letters to the editor, films, books, newspapers, etc have often served to reinforce the legitimacy of the nation state—even when the state is acting un-democratically. That is, representations of professional baseball sometimes enact the very opposite meaning of what the game’s myth-makers claim it represents (democracy, freedom, etc). Relatedly, do you identify most comfortably as a writer or as a scholar? Or baseball fan? I identify most comfortably as a mammal lazily witnessing the demise of the anthropocene. I’m sort of joking. I’ve become more of a writer than a scholar because craft has taken on greater importance for me over the years. Craft enables information to achieve force. Writing this book has been a kind of exorcism, so I think I’m ready to become a baseball fan again. The detail and minutia you uncover is astounding. It makes Ken Burns’s 10-inning documentary look like a brief introduction. How did you do this research? I started by never, ever watching Ken Burns’s baseball documentary, and then I re-invented the wheel using sources that fit my own whims. I absorbed old newspaper articles, took trips to archives at the Baseball Hall of Fame, New York Public Library, and Hoover Presidential Library, found random books that spoke to me out of the blue, and so forth. A key moment was that in 2007 a man named Dave Filipi screened “Rare Films from the Baseball Hall of Fame” at Block Cinema, north of Chicago. He showed film footage that Yankees Andy Carey and Elston Howard shot in Hiroshima in 1955. By then I already knew that Del Webb, the Yankees owner, had profited by building internment camps for Japanese Americans. So these images of what the Yankees saw when they visited Hiroshima were very powerful in that context. Filipi also screened some of the old Gillette ads, and later I received both the Japan film and several ads on a DVD from the Hall of Fame and did my own write-up. But there are hundreds of examples like these. Eventually this raw research shaped how I see the sport’s role in our culture, and once I had developed this unique angle of vision it became easy to spot additional examples. They’re everywhere. This book could have been 400 pages long. I should stress that I am not disparaging Ken Burns. I’m planning to watch his entire baseball documentary, but not for another few months. I really enjoy his work, but I thought it best to avoid it while writing my book. I also avoided watching Bull Durham until after I finished final edits with Coffee House. 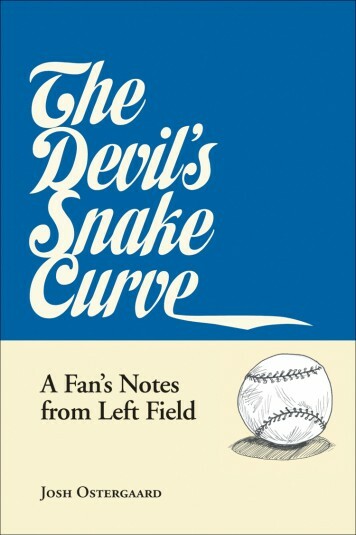 I think if I had seen Bull Durham ten years ago I would not have felt the need to write The Devil’s Snake Curve because compared to the fake piety the sport is imbued with now, the way it’s represented in Bull Durham is incredibly refreshing. It would have been my glass of water. What are some of the most unexpected sources that you included in the book? I was surprised to find myself quoting from Me & the Spitter, the unrepentant memoir by the old spitballer Gaylord Perry. That’s because I didn’t use baseball books that often in my research, and because I found that particular title long after Coffee House had acquired my book. I love Perry, by the way. I don’t view throwing a spitter as a bad kind of cheating. It takes skill. Baseball—and your book—goes back a couple centuries. Are historical games and plays as interesting to you as those of recent years? I love baseball history, and in truth I find it a lot more interesting than the contemporary sport. I find it difficult to care who wins or loses, and also I don’t have cable TV or any capacity to watch TV unless I’m at a friend’s house or in a public space with a TV. Maybe I care less because the Royals have been bad for so long, and because I lived a few blocks from Wrigley Field for several years. If winning was the only point I’d have gone insane long ago. Or maybe I did go insane, and that’s how I wrote this book. Though if I was truly insane I don’t think I’d have been able to organize my thinking effectively or attend to aesthetics or write a useful cover letter. You mention hundreds of names, people related to baseball or politics, but even when you tell the story of the Cubs playoffs in 2003, you don’t name Steve Bartman. Why not? You’re very observant. I chose not to mention Mr. Bartman in my book because although I think what happened in 2003 is interesting and important in its own small universe, I feel bad for how he was treated. I could have excised the entire passage from The Devil’s Snake Curve, but I didn’t. Instead I excised his name as a small, possibly meaningless tip of my hat. Are there any baseball events that you wanted to include, but couldn’t tie in? There are countless examples I could have included because the history of the sport is so incredibly rich and strange. Babe Ruth supposedly ingested some kind of concoction made from the testicles of a bull. I could have inserted this into the book, but I rebelled against doing so. I felt that I didn’t need to include every example of my larger themes, because I hoped the reader would bring their own knowledge to my book and fill in the “gaps.” And from a strategic perspective, I thought I’d be more likely to win over a reader if I allowed them to bring to the text their own versions of the patterns I was developing rather than just being force-fed. That’s another reason why I chose not to use much theory, explanation, or narration. Those tactics felt worn out to me at the time. I really wish I could have written something about Robin Ventura charging Nolan Ryan and how Ryan got him in a headlock and punched the top of his head a dozen times, but I couldn’t see how to make it fit. I just wanted to include it because it was awesome. That’s not a good enough reason to put something in a book—I learned that through countless revisions. Nelson Cruz joins my team, the Orioles, this season, after a 50-day suspension for using performance enhancing drugs (what you refer to in one instance as “testicular elixirs”) when he was with the Rangers last year. When my team picks up someone embroiled in all that, I feel bad. I am conflicted about cheering for the player because I hate the controversy around it. My question is, am I being naive? What matters more than wins? I understand the feeling. It might be naïve, but I understand it. I have a gut-level reaction against players who use steroids, even though I applaud spitballers. I’m not sure I understand why. Maybe because I believed so strongly in the mythology of the game, and when McGwire broke the record held by Roger Maris it seemed to be meaningful and profound. Granted I was young. Now it doesn’t seem like much of an accomplishment. But the thing that turns me off even more than steroids is that players are expected to be good people, or moral examples, and as a result they are so incredibly boring that I have a hard time caring about them. That’s why I like baseball history. In the past there was plenty of self-censorship among players, and through the strategic omissions of sportswriters, but if you look at broad swaths of time there are plenty of interesting characters. Are the Royals still your team? If KC wins the division this year I’m not sure I deserve to celebrate, because during these past few years I’ve been upset with the ownership, to say the least. I guess I don’t have a team. Or maybe my team is whomever I play wiffle ball with next.